Pictured from left: Caregiver Tanya Fulks, Day Care Board member Rusty Saunders, Pastor Paul Voss, Administrator Becky Hess and Secretary Gloria Shamblin. 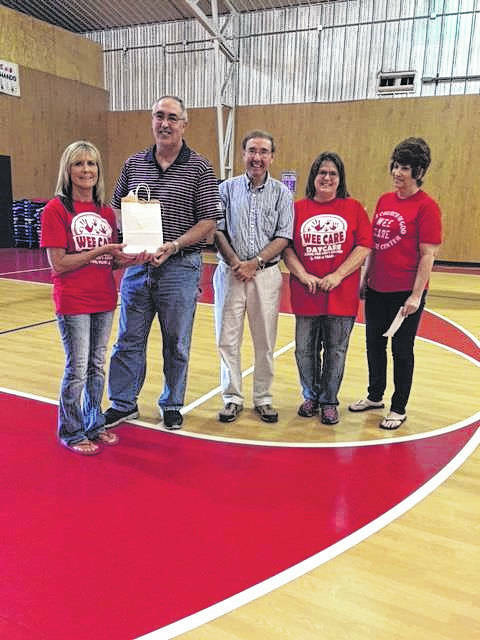 In September, the First Church of God Wee Care Day Care celebrated a milestone of service to the Gallipolis community. Wee Care Day Care has been providing quality Christian day care service for 25 years. Wee Care originated at the 109 Garfield Avenue site in September 1992. The original board members consisted of Jean Saunders, Gloria (Bickle) Shamblin, Kelly (Bosworth) Brush, Pastor Paul Voss and Diana Sanders. Since that time 636 students have graduated from Wee Care Day Care. The First Church of God, Wee Care Day Care celebrated their milestone with various fun activities. Parents were invited to join in on the fun as well. Activities included bouncy houses, food and fellowship. Special recognition was given to Tanya Fulks for her 25 years of service. For more information call 740-446-2440.